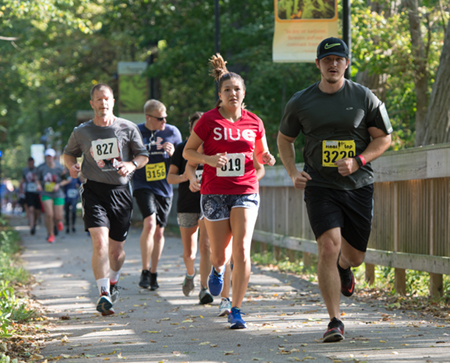 Southern Illinois University Edwardsville’s second annual Cougars Unleashed Homecoming Run saw more than 300 participants cross the finish line on Saturday, Oct. 7. The run across SIUE’s expansive campus was followed by a delicious world-famous Chris Cakes pancake breakfast, and refreshments from locally-owned Recess Brewing. Proceeds from the event will benefit SIUE Alumni Association Scholarships for deserving students. “We look forward to continuing to grow and improve the Cougars Unleashed Homecoming Run, as it has now been established as a signature part of SIUE Homecoming tradition,” Kehrer concluded. Photos: Participants in the SIUE Cougars Unleashed Homecoming Run celebrate the successful event. 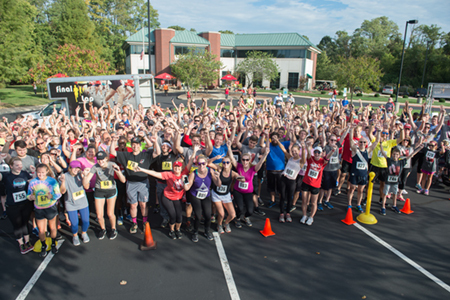 More than 300 participants took part in the second annual Cougars Unleashed Homecoming Run.